Travelers line up to check in at the Irbil International Airport, in Iraq, Wednesday, Sept. 27, 2017. Iraq's prime minister ordered the country's Kurdish region to hand over control of its airports to federal authorities or face a flight ban, a response to the Kurdish independence referendum. IRBIL, IRAQ (THE ASSOCIATED PRESS) — The Kurdish referendum on independence from Iraq was approved by more than 92 percent of voters, officials said Wednesday, as Iraq's prime minister vowed to keep his country united without resorting to the use of force. 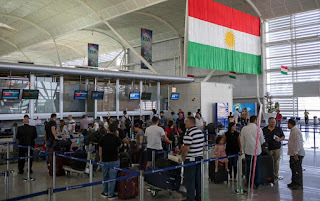 Even with the strong support, the non-binding vote is unlikely to lead to formal independence, but it has escalated long-running tensions with Baghdad, which has moved to block flights in and out of the Kurds' autonomous region. Iraq and its neighbors, along with virtually the entire international community, are opposed to any redrawing of the map. Hendrin Mohammed, the head of the Kurdish region's election commission, announced the official results at a press conference, saying the referendum passed with 92.73 percent support and turnout of more than 72 percent. The vote was held across the autonomous Kurdish region's three provinces as well as in some disputed territories controlled by Kurdish forces but claimed by Baghdad. Mohammed said the counting of votes was complete and that the results would be considered final once they are certified by the Kurdish region's department of justice. The commission did not comment on turnout in the disputed territories, which could serve as an indicator of how many people in those areas prefer Kurdish rule. Mohammed told The Associated Press those numbers would be released by local authorities, without elaborating. Iraq's Arab-dominated parliament has given Prime Minister Haider al-Abadi the mandate to deploy troops in the disputed territories, including the oil-rich city of Kirkuk, but al-Abadi said Wednesday he doesn't want a "fight between the Iraqi citizens." At a meeting with lawmakers, he instead vowed to "enforce the rule of the federal authority in the Kurdish region with the power of the constitution." Parliament has demanded that Baghdad refrain from taking part in any dialogue with the Kurds until the results of Monday's vote are cancelled. It also called on the government to bring those behind the vote, including Kurdish regional president Masoud Barzani, to justice. The demands are non-binding. Al-Abadi has ordered the Kurdish region to hand over control of its airports to federal authorities by Friday, threatening a flight ban if they refuse. Iraq's Transport Ministry has ordered international airlines to halt service to Irbil, the Kurdish regional capital, and Sulaimaniyah, its second city, beginning Friday evening. Middle East Airlines, the flagship carrier of Lebanon, and EgyptAir have announced that they will comply, cancelling all flights after Friday. Low-cost airline FlyDubai says its flights to Irbil are in question from Saturday on. Turkey has warned its citizens that flight service to the Kurdish region will be suspended as of 6:00 p.m. Friday (1500 GMT). A statement posted on the Turkish Consulate's website in Irbil said flights by Turkish Airlines, AtlasGlobal and Pegasus "won't be possible" after Friday evening. It added that authorities were working to increase flights until then. The transport minister for Iraq's Kurdish region said Wednesday the region's international airports have not violated any laws that would warrant their closure. Mawlood Bawa Murad told reporters his ministry is ready to negotiate with Baghdad "if they want to implement the law and show that Iraq has one air space." He added that the flight ban would affect, "one way or another, the military aviation that operates from Irbil international airport," which is used for the campaign against the Islamic State group. Associated Press writers Sinan Salaheddin in Baghdad, Sarah El-Deeb in Beirut, Bram Janssen in Irbil, Iraq, and Suzan Fraser in Ankara, Turkey contributed to this report.